There are currently 69 people online. CNET reports Intel is pushing laptop makers to adopt a standardized battery cell design for their ultrabooks. The plan will hopefully lead to cheaper products. 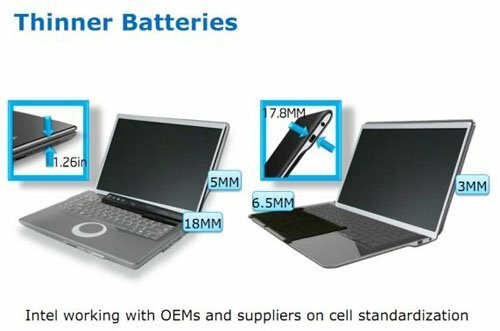 This may be a reason that Intel is pushing laptop manufacturers to adopt a standard battery cell (a typical notebook battery is made up of multiple cells) design for their Ultrabooks. The company has proposed a 60 x 80mm cell design that is 16mm thin, which is slightly slimmer than the 18mm versions used on standard laptops. While even thinner designs are possible, Intel says that they are more expensive and provide less power.